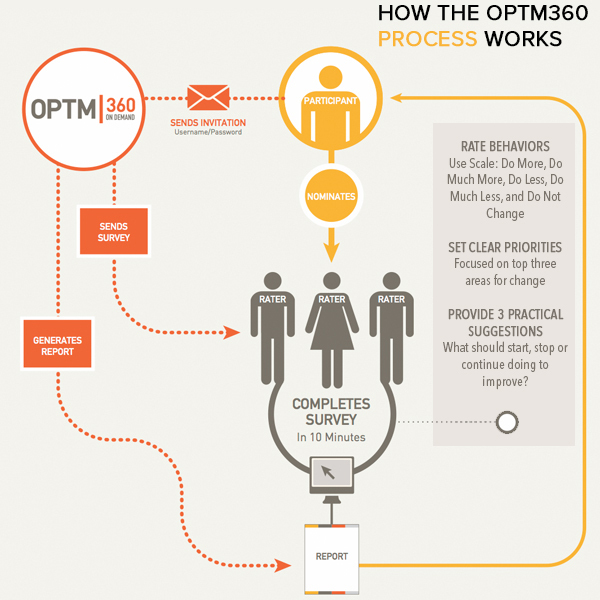 The OPTM360 is a radically different 360, intentionally designed to appeal to progressive organizations looking to create true behavior change. It does away with complexity and bureaucracy and instead offers a simple approach to developing high-quality talent in a fast, efficient way. Typical 360s fail because they're designed to assess, not develop. They create negative emotional reactions that block the desire to change. The OPTM360 accelerates individual development by making it easy to give, receive and take action on feedback. The web-based survey tool elicits specific suggestions for change & takes approximately 10 minutes for raters to complete. 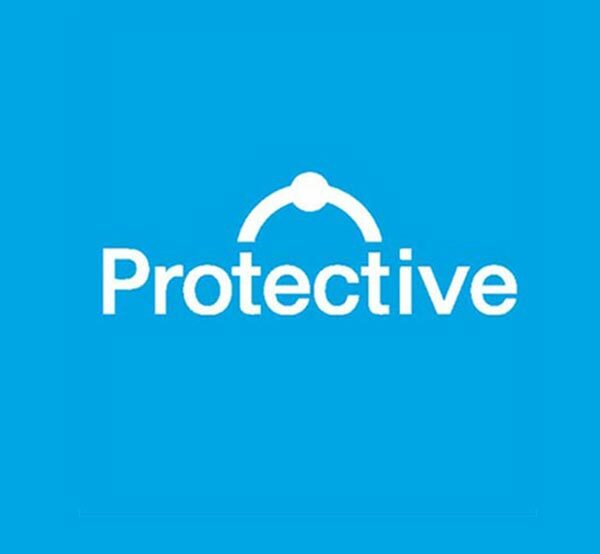 The survey can be completed in less than 10 minutes so you can send it to a broad group of colleagues, direct report and even contacts outside of your company. The unique scale – "Do Much More" to "Do Much Less" – instantly prioritizes development actions. Raters will find the process to be far less overwhelming than other 360s they may be familiar with. The brevity of the survey will increase response rates, so participants will receive more helpful suggestions. The standard survey items cover the vast majority of behaviors that make employees more effective, drawn from strongest academic research about what effective leaders and managers do. Since the survey is 100% customizable, you can add to or delete from this model as desired. The OPTM360 accelerates individual development by making it easy for everyone to give, receive and take action on feedback. The OPTM360 focuses people on the three behaviors that their respondents say matter most. 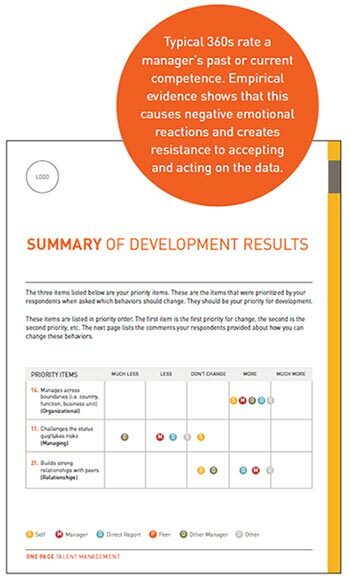 Within minutes of receiving their report, they will know exactly which behaviors should change and how they can change. People will receive specific advice for changing their behaviors from the people who work most closely with them, using acronyms they can relate to and references they will respond to. Typical 360s fail because they're designed to assess, not develop. They create negative emotional reactions that block the desire to change. The OPTM360 gives people helpful guidance about how to improve their behaviors going forward, without judging the past. The OPTM360 report is easy to understand and doesn't require an HR leader, coach or consultant to "interpret" the meaning of the report. People can start improving their behaviors immediately. The OPTM360 is a proprietary online survey software used for conducting 360 degree feedback evaluations. This is different than other traditional 360 feedback tools because it accelerates development by giving employees easy­ to ­understand, prioritized advice for quickly changing their behaviors. 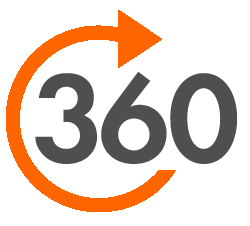 360 feedback is a process where people receive confidential feedback from their managers, colleagues and peers. 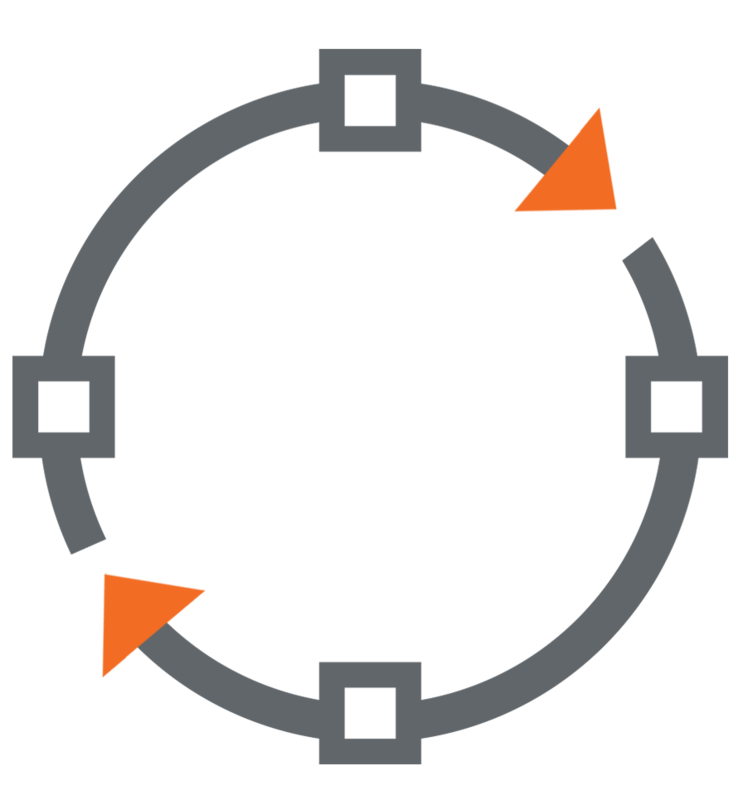 OPTM360 feedback helps employees prioritize on the most important behaviors to change and gives them specific, practical advice for how to change. Our 360 tool includes feedback from an employee's subordinates, peers and supervisor(s), as well as a self-evaluation by the employee himself or herself. The OPTM360 is guided by the science of an individual’s behavior towards feedback.1. People often reject information that threatens their self-image, and how people receive feedback influences whether they take action. Our carefully crafted a 360 degree feedback process knows that people respond better to feedback that doesn't compare them to others, so we don't use norms. Our report provides direction and advice for change in a way that leaders can quickly understand, internalize and put into practice. For the science we rely on, see the cites in One Page Talent Management (Harvard Business Review Publishing). How does the 360 degree feedback process work? A 360 evaluation feedback process starts with the person who will receive feedback (participant), and a list of people who will provide feedback to that person through a 360 survey (raters). The participant and raters complete a brief survey. 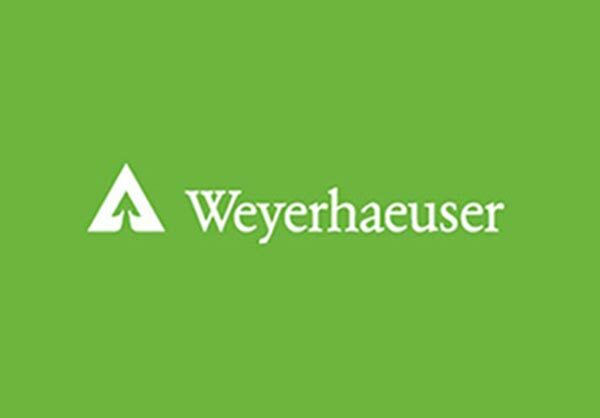 The survey includes a list of workplace behaviors and job competencies either specific to a company or those we have identified as being shared by high-­performing leaders. 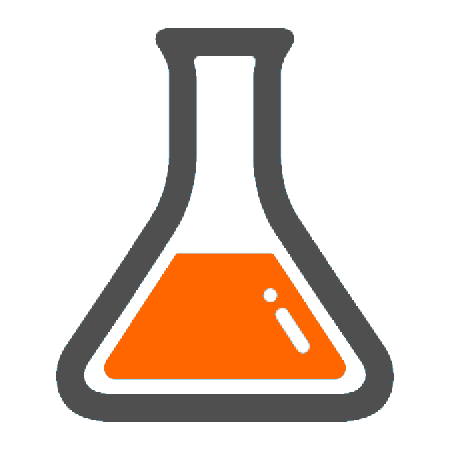 Once raters have finished, a report is generated and shared with the participant. That report helps develop the participant by telling them the few things they should focus on and how they can develop those capabilities. If your company already has an 360 process in place, our process can be an an additional tool to support leaders. If your company has not used 360 degree feedback before, the OPTM360 can be a strategic tool to develop your workforce.